July was an exciting month for wine writer, judge and engaging ABS lecturer Nick Ryan. Along with Marni Ladd, Program Director of Wine Business at the University, and other wine experts, Nick travelled to Singapore as a speaker at the Hot 100 inaugural international wine event. Nick was a fitting MC at this exciting masterclass, which has not only helped to raise the profile of South Australia’s wine industry, but has also commenced the critical task of boosting cultural and business relationships between our two regions. For 10 years, the well-known Hot 100 Wines has been finding and celebrating the most drinkable wines in South Australia through the largest South Australian wine show. To celebrate this decade long milestone, the ABS joined forces with the Department of State Development and Brand South Australia to support The Hot 100 Wines in showcasing Australia’s wine story internationally. The successful Singapore masterclass, held at internationally-renowned restaurant Pollen, discussed the drinkability and business of wine, and proudly showcased our state’s top 10 unique and brilliant wines and winemakers for 2015/2016 to the South East Asian market over a degustation lunch. Launched by the Hon. Leon Bignell, Australia’s Minister for Agriculture, Food, Fisheries and Tourism, the event saw the Minister, Nick Ryan and Banjo Harris Plane, Hot 100’s Chief Judge, joined by Melbourne’s Dan Sims from Bottle Shop Concepts, Andrew Cameron and Singapore-based wine writer Lim Hwee Peng share insights into the connection between South Australian wine and South East Asia. They also discussed the concept of drinkability, the business of wine and South Australia’s energetic wine community. Of course celebrating and supporting the South Australian wine industry is a passion and strength of the ABS. This exciting international wine event perfectly coincided with the recent launch of its wine business short course lecture series, which was developed to complement and map into the existing Masters program, making post graduate business education more accessible to the industry. Run in partnership with Executive Education and featuring Nick as a key lecturer, our series of five courses provides current and prospective wine industry professionals with the necessary skills, frameworks and knowledge to achieve profitability and a competitive edge in the crowded, global market. Our well thought out series explores every aspect of running a successful and effective wine business, including Wine Writing and Communication, Promoting You and Your Brand, Introduction to the Business of Australian Wine, Evaluating Wine Markets, and Mastering Asian Wine Markets – an essential course given the recent growth in exports to the region. As a leader in wine education, we will continue our active involvement in wine industry events. 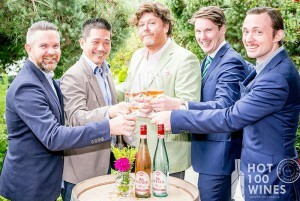 We are proud to be a platinum partner in the Hot 100 Wines inaugural international wine event and will enjoy many future opportunities provided by this alliance (such as involvement in the inaugural Hot 100 Harvest event, and access to the VIP and Judges-only dinner for the main Hot 100 program). Given its success here and in Singapore, it’s no surprise that Adelaide Review’s Hot 100 Wines is already busily arranging a similar event in South East Asia next year. And, without a doubt, that’s an important wine event that the ABS and Executive Education will be proud to support and be actively involved in once more. This entry was posted in Connect, News, Wine Business and tagged Adelaide Review, Brand South Australia, department of state development, Hon. Leon Bignell, Hot 100, Nick Ryan, South Australian wine show, Wine Business. Bookmark the permalink.